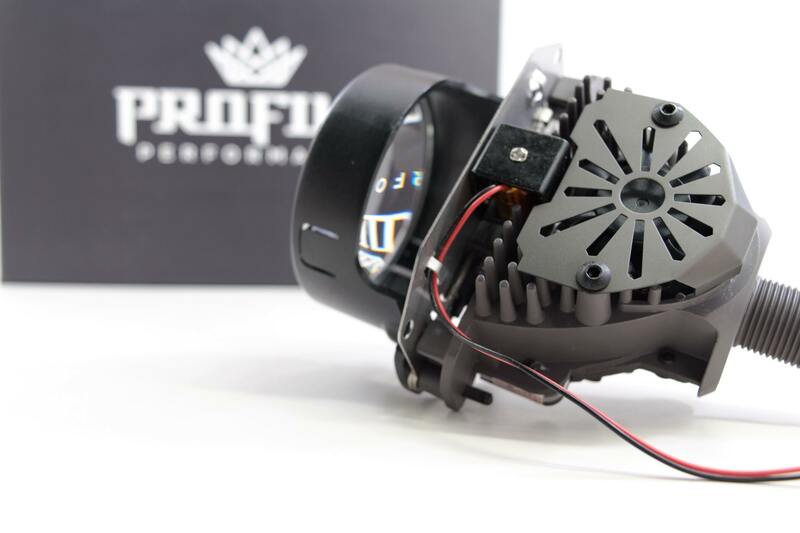 PROFILE PERFORMANCE: The automotive aftermarket’s best name in LED Lighting; and there’s no such more powerful and controlled way to light the road than with a set of high performance headlight projectors. 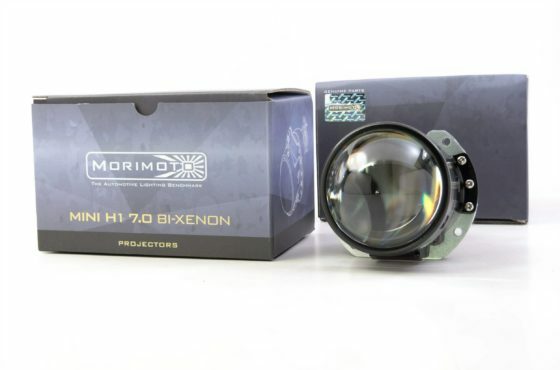 While Bi-xenon projectors have been the industry standard for over a decade, new options from both Morimoto and Profile are here to stay. We may be the LED Concepts crew over here, but up until now we thought LED was best suited for the accessories around your headlights, not the headlights themselves. We are confident enough to use the Bi-Lens LED projectors on our own cars, and therefore we’re confident enough to recommend them to you. WELL DONE: The Profile Bi-Lens projector is plenty bright, and we’re not talking big blob of uncontrolled light-bar bright. We’re talking well-controlled, non-glaring light output for use on the road. Their advanced optics, curved cutoff shield, and CREE XHP35 chipset come together to create a properly distributed and wide beam pattern with a proper ECE style step in the middle. With a factory-installed clear lens, the cutoff like is nice and sharp/colorful. EASY INSTALL: Despite the fact that there’s a bit of extra heft on the back of the projector, their overall size is pretty similar to something like Morimoto’s Mini D2S 4.0. 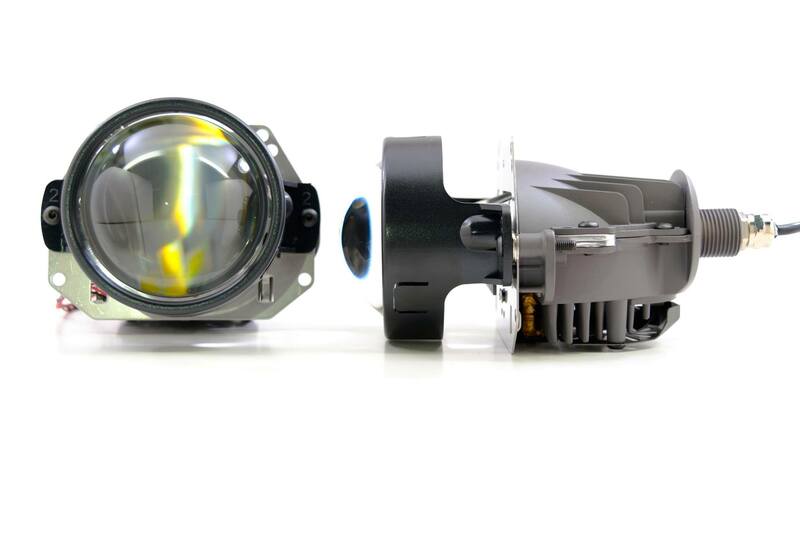 Respectably compact enough to fit in most headlights, the Bi-Lens features a threaded-shaft style mount on the back that allows the projectors to be locked on with their included hardware, and minimal modifications to your headlight. If you’ve been considering a Mini H1 retrofit for the ease of install, these are a comparable option to think about. 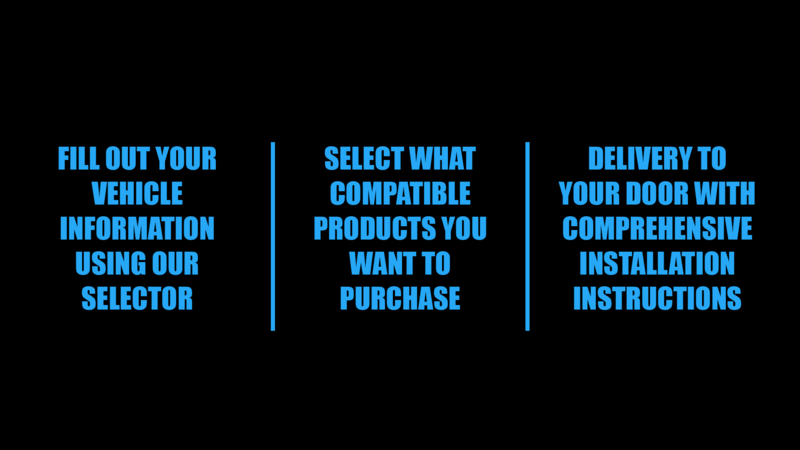 SIMPLE: Separate bulbs to buy? Nope. Big ballasts to mount? Nada. Relay harness to run? Not a worry. 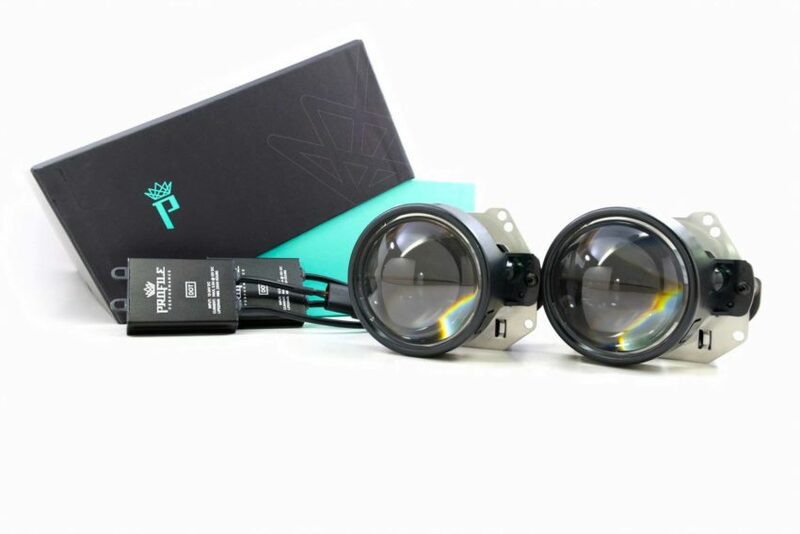 The Profile Bi-Lens setup is nothing more than the projector itself and the small external LED driver to regulate power. If you dont have the space or simply the patience to deal with all the necessary gear that powers HID-based systems, that’s reason enough to look further into going all LED. CONSTRUCTION: The Profile Bi-Lens LED is a solid start in the LED projector world. The die-cast aluminum body feels heavy duty, and has more than enough surface area to properly cool the LED chip set. The die-cast cutoff shield is done with precision, and the reflector bowls have a perfectly metalized finish. Clarity of the lens is great. We’re not so sure they spec’d a Hi/Lo solenoid that looks like a leftover from an old Mini H1, and the wiring/driver could be a bit beefier – but if you can look past the small things; overall it’s a well-executed design. 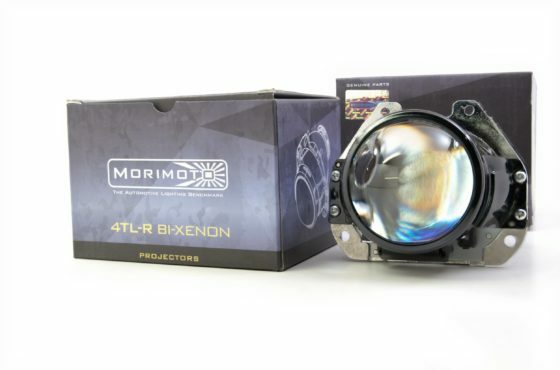 COMPATIBLE: Conveniently, the Profile Bi-Lens LED projector is compatible with most every retrofit bracket on the market that’s been designed around the Morimoto Mini D2S 4.0. 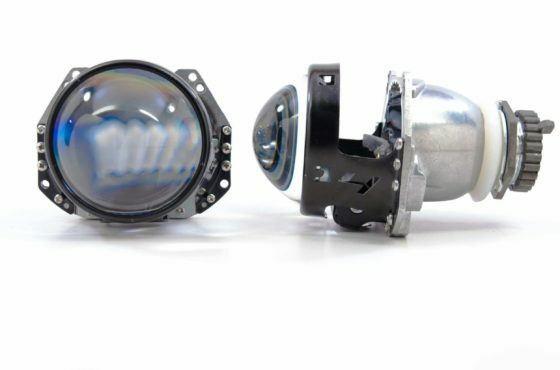 Since the bolt pattern on the main mounting bracket is shared between the two projectors, if you’re looking at something thats made for the Mini, then chances are you’re looking at something that’s made for the Bi-Lens too. Nice!